Feel swept away in 2010. 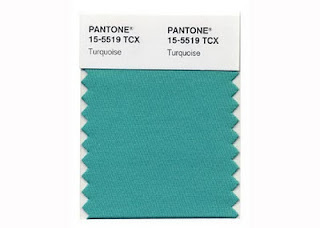 Pantone announced its 15-5519 Turquoise as the color of the upcoming year. The hue was chosen for its combination of serene blue and invigorating green, as well as its ability to evoke thoughts of soothing, tropical waters and an escape from the everyday troubles of the world. "In many cultures, turquoise occupies a very special position in the world of color," said Leatrice Eiseman, executive director of the Pantone Color Institute. "It is believed to be a protective talisman, a color of deep compassion and healing, and a color of faith and truth, inspired by water and sky. Through years of color word-association studies, we also find that turquoise represents an escape to many–taking them to a tropical paradise that is pleasant and inviting, even if only a fantasy." Turquoise appeals to both men and women and translates to fashion, as well as interiors. With both warm and cool undertones, turquoise adds a splash of excitement to neutrals and browns, creates a classic maritime look with deep blues, livens up other greens and is trendy when paired with yellow-greens. The hue is available in Pantone's line of eco-friendly paint. Ideal for a powder room or kitchen, turquoise offers a spa-like feel or when used as an accent, creates lively visual interest.